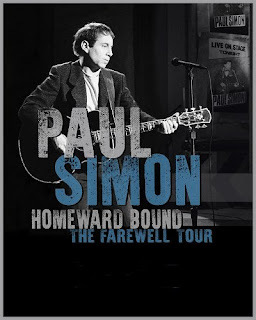 Legendary songwriter, recording artist and performer Paul Simon has announced the final leg of Homeward Bound – The Farewell Tour, culminating with four shows in the New York Cityarea: the Prudential Center on September 15 in Newark, NJ (the city where Simon was born), and two nights at Madison Square Garden on September 20 and 21, with an additional concert to be announced soon. As previously announced, Simon and his band will embark on the artist's final tour May 16 in Vancouver, bringing to the stage a stunning, career-spanning repertoire of timeless hits and classic songs. Tickets for the third and final leg of Paul Simon's Homeward Bound – The Farewell Tour will go on public sale beginning Friday, March 16 @ 9am ET. The additional and final concerts are below. He said of this farewell tour, "I've often wondered what it would feel like to reach the point where I'd consider bringing my performing career to a natural end. Now I know: it feels a little unsettling, a touch exhilarating and something of a relief. I love making music, my voice is still strong, and my band is a tight, extraordinary group of gifted musicians. I think about music constantly. I am very grateful for a fulfilling career and, of course, most of all to the audiences who heard something in my music that touched their hearts." During his unparalleled career, Simon has achieved 29 Top 40 singles in the U.S. alone, with 14 of those reaching the Top 10 or higher, including "50 Ways to Leave Your Lover" (which reached #1), "Kodachrome," "Loves Me Like A Rock," "Mother and Child Reunion," "Late In The Evening," "You Can Call Me Al" and many others. With Simon & Garfunkel, he wrote and performed the #1 singles, "The Sound of Silence," "Mrs. Robinson," "Bridge Over Troubled Water," and numerous other timeless hits.